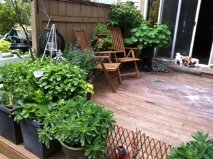 No room for a garden you say??? 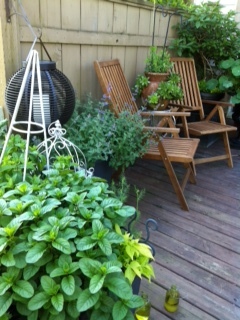 This the grand tour of my back deck garden at my townhome in South Surrey. I have a lovely southern exposure, which really helps. My boys have built a ground level deck to cover the whole grass area which gives me soooo much more room. 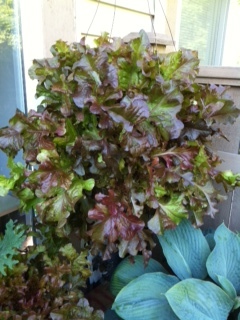 Here is my variegated lettuce hanging basket. Isn’t it gorgeous!! I used a moss basket I kept from last year and sliced holes in the moss and layered up lettuce plant seedlings all the way up! It looks so pretty and you clip off what you need and it grows back within days. 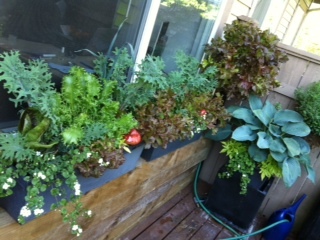 You can grow your own lettuce on your deck! 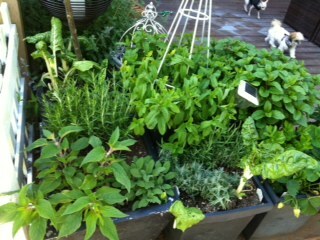 I always tell my clients if you think you can have a garden at least grow one thing like lettuce. Then at least you know where ONE of your foods came from! 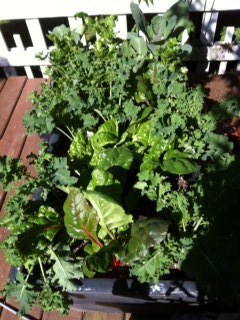 ….below the hanging basket of lettuce is my window box filled with black kale, frisee and chives. 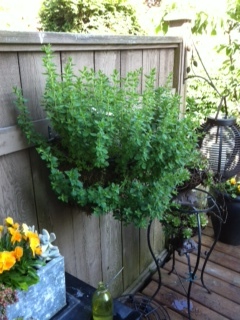 Then there are the hanging moss baskets of oregano, thyme and savory, but they hang on the fence! 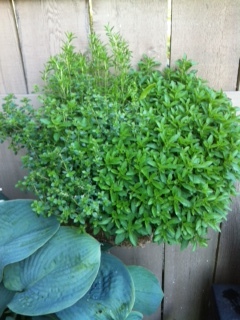 Below is my mint garden in one container. Another container has my sage garden and rosemary and then my vegetable garden container with rainbow Swiss chard, purple and green cabbage that I use for garnish, garlic chives and more kale.